Patrick Callen and I started BAG in his apartment above a pizzeria right next to the well-known Khyber Pass Pub on 2 Street in Philadelphia. With the unique distinction of utilizing a Commodore 64 computer to synchronize via MIDI a Yamaha drum machine with a Roland Juno 106 keyboard, BAG was perhaps the first band to perform live on stage with a computerized musical accompaniment in the Philadelphia area in 1985. BAG could best be described as a zany, vaudevillian rock group. Incorporating costumes, props, video and unusual themes, their performances garnered much interest from their devoted following and local media alike. They performed at well-respected venues like The Painted Bride, Chestnut Cabaret, CBGBs (NYC), Revival and others. In 1989, BAG produced their first and only EP titled “Happy Family”, engineered by David Ivory. It featured an eight-piece band including horn section. Their record release party was held at the Chestnut Cabaret in Philadelphia with Andre Gardner as Master of Ceremonies from radio station, WYSP 94.1 FM. no1uno was an exclusively studio based band crafting songs and soundscapes from the sonic tools at hand. 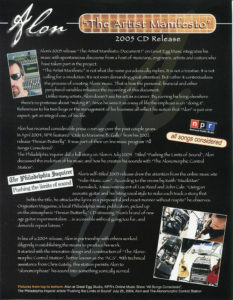 With the advent of the internet, we marketed our works on line via our website, no1uno.com, and our distributor, CD Baby. The band comprised of Dan McKay (mazlin wratch) on guitars and keyboards, James Sempsey (iii) on vocals, guitars and keyboards and Marc A. Gallo (gallospole) on vocals, guitars, ebow and keyboards. All programming, engineering and mixing was executed by McKay and I.
no1uno released two CDs, titled “no1uno” (EP 1997) and “no1uno2” (LP 1999). The music is an eclectic mix of the following genres; industrial, electronic, grunge, ambient and folk. We produced the music video “Free” from our first EP with John Donlevie. WHAT DID SHE REALLY DO? Starting as a singer-songwriter with a Gibson 6-string acoustic guitar, Alon quickly evolved into an elaborate sonic production. 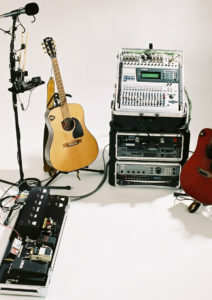 With the development of the Alonomorphic Control Station (ACS), a customized mobile rig co-designed with Chris Gately, his music integrated backing tracks with numerous musicians plus two independent microphones and acoustic guitars (a Gibson 6-string and a Guild 12-string) manipulated by automated effects to morph into his own unique sound. Alon, aka Marc A. Gallo, performed in the Mid-Atlantic region including notable venues like Kenny’s Casataway (NYC), Tin Angel (Philadelphia) and appeared on the Gagliarchives, hosted by Tom Gagliardi, a progressive rock station broadcasted worldwide. He also was featured in Performing Songwriter and Progression magazines, the Philadelphia Inquirer and NPR’s All Songs Considered. Alon released three EPs: Persian Butterfly (2002), Alon (2003) and The Artist Manifesto: Document 1 (2005) on Great Egg Music and available at CD Baby. In addition, he produced two music videos with John Donlevie and Jerry Bennett, Walking Contradiction (2003) and Burn (2004). Imagine swirling delays, cascading harmonies, screeching distortion and other mesmerizing sound effects originating from one performer’s voice and acoustic guitars. This sonic presentation that takes on the aura of a fully orchestrated soundtrack is actualized by Alon’s proprietary, customized studio rig, “The Alonomorphic Control Station” or “ACS”. Featured in the June 2005 issue of Performing Songwriter magazine, this station uniquely integrates the Yamaha O1V digital console with the Eventide Ultra-Harmonizer H3000SE, the Roland DEP-5 digital effects processor, the Sony CDP-D11 CD player and MDS-E12 Mini-Disc recorder as well as the Shure ULXP4 Professional Diversity Wireless System. 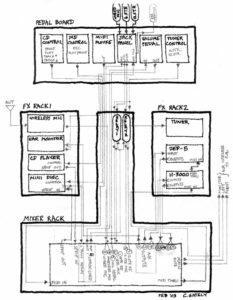 These are all in part controlled by his proprietary, customized pedalboard that can activate CD playback, make MIDI program changes via the Tech 21-NYC MIDI Mouse as well as route audio signals to various processors through the Morley PVO Series Volume Pedal. There are two mute/router switches for each acoustic guitar, the Gibson WM-10 six-string and the Guild D212CH twelve-string. These guitars can be tuned on demand by the Korg DTS-1000 digital guitar tuner. 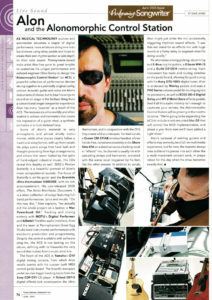 His pedalboard also uses the Boss DD-6 Digital Delay and Metal Zone MT-2 foot pedals to affect his six-string acoustic guitar. The “ACS” is all networked via Elco connectors. This allows for a quick set up and sound check. There are only three outputs, the mains (left and right) and monitor (mono). Additionally, this control station can record his live performances digitally via Sony’s Mini-Disc recorder, making it easy to compile the best recordings for future release. His guitars utilize the Fishman Rare Earth Blend pickup with two audio outputs, a microphone and a humbucking pickup, to feed an array of processors. Additionally, he utilizes the Crown CM-311AE wireless headset as his main vocal microphone and the Shure Beta 87A as an alonomorphic mike routed to pre-programmed delays, filters and harmonizers.